My original plan was to present you with a plate overflowing with sugar cookies in a variety of shapes and colors…and then I forgot about them and burnt them to a crisp. Oops. We were able to salvage these seven cookies, though, and the show must go on! 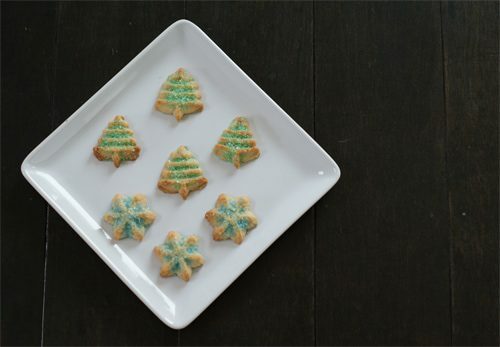 Sugar cookies are versatile (more on various ways to make/decorate them coming soon! ), fun to make and even more fun to eat. And really, they’re so simple and easy too. I’ve always used the Pampered Chef sugar cookie recipe, which you’ll find below. Mix flour and salt in a small bowl. In a large bowl, cream butter and sugar. Beat in egg, milk and vanilla. Slowly add flour mixture mixing until well blended. Fill cookie press with dough and carefully press the dough onto a cookie sheet or baking stone. Decorate with sugar crystals or sprinkles. Bake 12-14 minutes or until edges are light brown. Let cool on cookie sheet or stone for 3 minutes and then move to a cooling rack to cool completely.